While there are many bows to chose from, one in particular caught my eye. I borrowed it from a friend of mine and after shooting a dozen arrows, I went to Cabela’s and bought one. It’s a great bow and one that almost anyone can afford. I love mine. The Samick Sage is a great entry level bow and is also a favorite amongst long time archers. This bow making company has been around for over 40 years and has an excellent reputation for making quality products.I have been shooting my own handmade primitive longbows for years and I wanted a bow with a bit more punch. I have been extremely happy with the quality and the accuracy of this bow. This is a no-tools takedown bow which is nice if you want to pack it away. It consists of a riser, two limbs and two thumb screws for easy assembly. The riser (center part where the handle is) is nicely made of laminate hardwoods and the limbs are made of hard maple wrapped with non-shiny black fiberglass. It comes complete with a decent bowstring and can be set up in about two minutes. 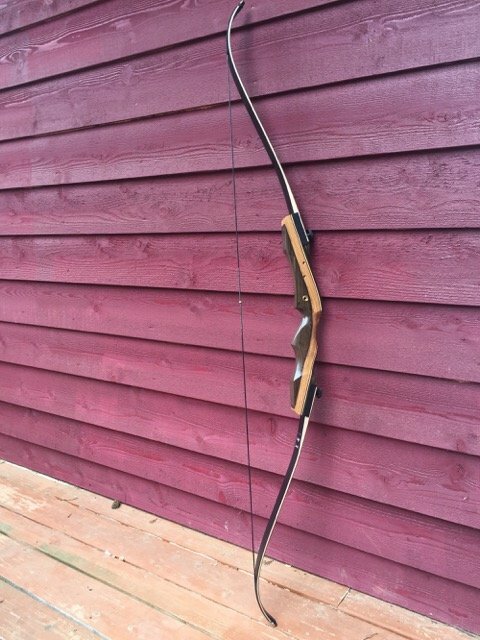 The 62” total length of this bow make it long but I found it to be just right for me (I’m 6’3”) You have a choice of right or left handed models that come in draw weights from 25 pounds all the way up to 60 pounds. I got the 50 pound model and ordered separate 40 pound limbs for hunting smaller animals (another nice thing about this bow). As you increase your strength and shooting form, you can increase the poundage of your bow without having to replace the entire bow. The Samick Sage has great ratings within the archery community. It was ranked number one best beginner bow and number three for overall best bow by “The best Recurve Bows.” At a price under $150, you can’t beat the value. Reviews by owners are all pretty similar and most if not all are very happy with the bow. Many bought this bow for they’re wife and kids as well and got the whole family involved in archery. That was cool to hear. Shooting the bow is very smooth and quiet. I found it to be really easy to shoot and was instantly surprised at how accurate it was. I shot about three dozen arrows at my 3-D deer target yesterday with only a few misses from 30 yards. That’s pretty good shooting for a bow I just got. All and all, I am very happy with this bow. It’s a blast to shoot, seems like it will last for years and it makes me take my skills to a higher level. I will use this bow come deer season, stay tuned for my review!